You can reformat your polar plot’s axes, using the Polar Axes page of the dialog box for formatting polar plots. 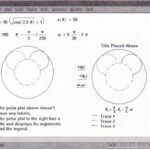 • Double-click in the polar plot. Alternatively, choose Graphee-Polar Plot from the Format menu. 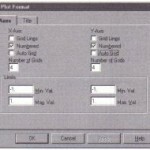 You’ll see the dialog box for formatting polar plots, shown below. • If necessary, click the Polar Axes tab. When this box is checked, the radial axis is logarithmic. Axis limits must be positi ve. 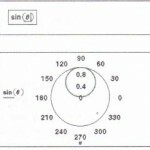 This setting is available only for the radial axis. Figure 21-10 on page 513 illustrates a polar plot with a logarithmic axis. When this box is checked, the tick marks on the selected axis are replaced by grid lines. If the axis is logarithmic, then logarithmically spaced grid lines are added if space permits. Radial grid lines are circles of fixed radius; angular grid lines radiate out from the origin at a fixed angle. 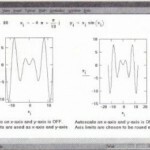 Figure 21-8 on page 512 compares a plot with tick marks to the same plot with grid lines. When this box is checked, the selected grid lines are numbered. Figure 21-8 on page 512 illustrates numbers being used with grid lines. When available, this text box indicates the number of tick marks or grid lines on the associated axis. You can enter a number between 2 and 99, inclusive. This box is only available when Auto Grid and Log Scale are unchecked. 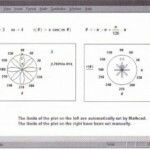 Figure 21-9 on page 512 shows the effects of defining the number of grid lines on both the radial and the angular axes. 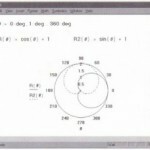 These buttons let you choose between crossed axes, no axes at all, and a plot enclosed by a circle (perimeter). Figure 21-11 on page 513 illustrates the difference between perimeter and crossed axes. 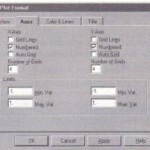 • Quickly restore a polar plot to its default format settings. • Use a particular plot as a model for all future polar plots.